Bako also contains a rich variety of wildlife and a coastline covered with small bays, coves and beaches. The park has a number of well-marked trails offering interesting walks ranging from short pleasant strolls to serious full-day hikes. Unlike some national parks, visitors to Bako are almost guaranteed to see wildlife. 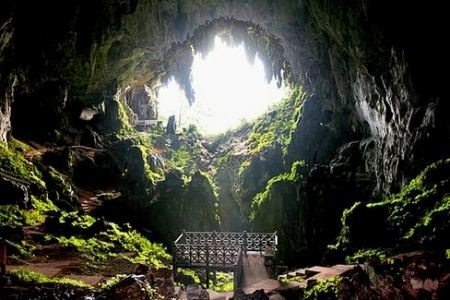 Bau is popular for its two beautiful limestone caves and has two important historical events. 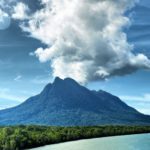 It is also a prime rock climbing destination of Kuching. The Fairy Cave takes its name from a stalagmite structure at the entrance that is said to resemble a Chinese deity. Inside, you will notice the great contrasts between the light entering the cave and its shadowy darkness, along with hues of brown and grey of the rocks – highlighted by the rich green of the moss – which offer many opportunities for the avid photographer. The rock surface outside the cave is where rock climbers do their ascent of varying difficulties. Another cave is called the Wind Cave, named after the constant cool breeze that blows throughout the cavern. Take the chance to observe the many swiftlets and bats that dwell within this large cave while you relax besides a subterranean stream that runs through the cave. Venture south of Kuching to Semonggok Wildlife Rehabilitation Centre and get an up close look at how dedicated locals and naturalists help to preserve, protect and rehabilitate orangutans that have been injured, orphaned or captured. Watch as these giant primates roam freely and witness rainforest feedings as part of this unique trip, which includes a short trek into the jungle and hotel pick up and drop off. Fort Margherita was built in 1879 to guard Kuching’s river approaches from pirates. In the old days, a canon shot was fired from here every evening to mark the end of the government work day. 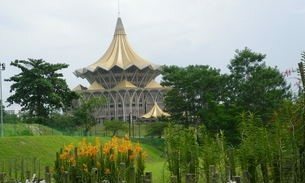 Named after Charles Brooke’s wife, Ranee Margaret, it is a unmistakable landmark along Sarawak River. Housed in a Fort named after James Brooke’s wife, Rani Margherita, the gallery’s irreplaceable historical documents, artefacts and arts from the White Rajah’s era, wrapped in steep history and preserved in time. 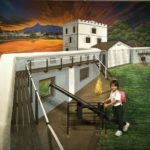 Get your bearings in the colorful, historic city of Kuching on a 3-hour walking tour that explores Borneo history from the White Rajahs to modern-day life. 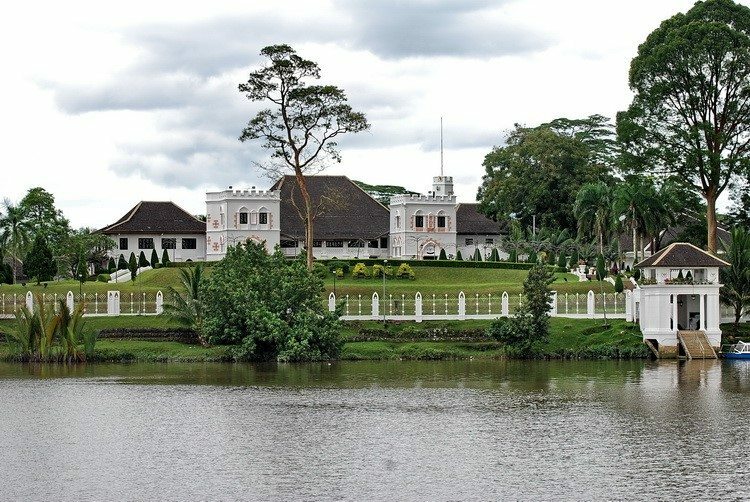 Walk from the waterfront to traditional Malay houses, a riverside mosque, and the imposing Astana, and explore Borneo’s cultural diversity in the Sarawak Museum. This small-group tour is limited to 7 participants for a personalized experience, and includes hotel pickup and drop-off, and entrance fees. 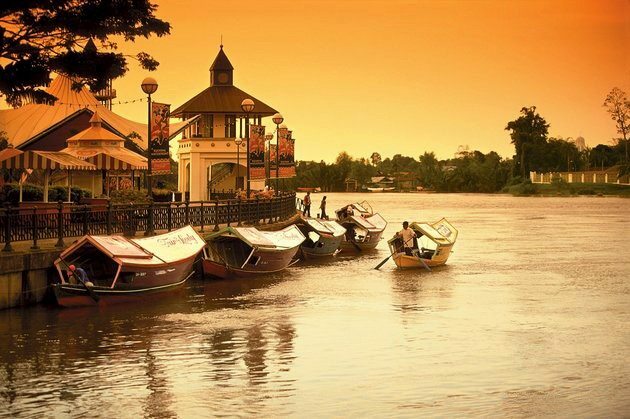 Only 35 minutes drive from Kuching, the Santubong area has a great deal to offer the visitor. 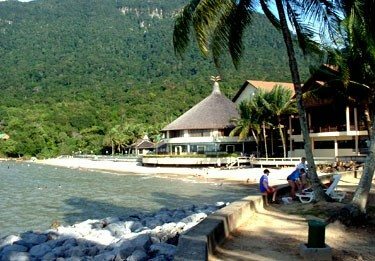 It has some superb natural attractions centred on the rainforested slopes of Mount Santubong, its mangrove forests, rivers, near shore waters and mudflats. 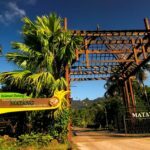 These different habitats are home to variety of wildlife making Santubong one of the best sites in Sarawak to see a range of wildlife in a natural setting. 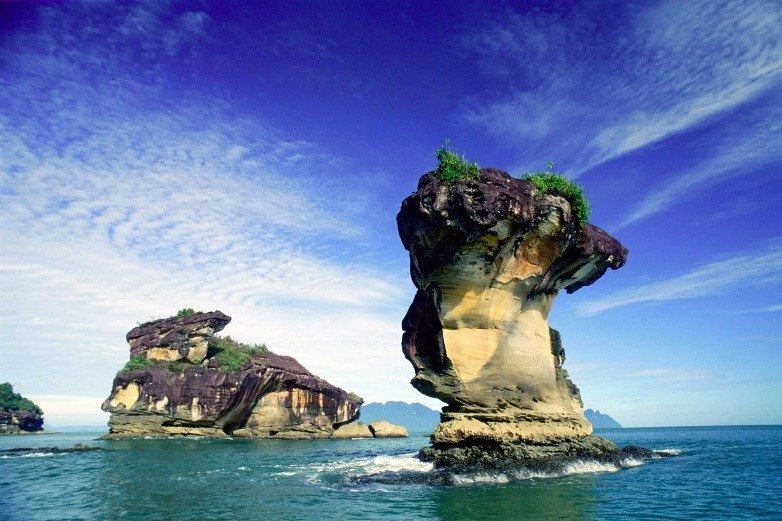 The Santubong area is one of the best places in Sarawak to see the rare Irrawaddy dolphin, which inhabits rivers, estuaries and shallow coastal areas. On rare occasions finless porpoises and Indo-pacific humpback dolphins are sighted in the waters off Santubong. There are a few interesting coastal villages (kampungs) in the Santubong Peninsula. The most accessible from Damai is Kampung Santubong, a well-kept Malay village at the foot of Mount Santubong. Matang Wildlife Centre, part of Kubah National Park, houses endangered wildlife in large enclosed areas of rainforest or spacious cages. The main attraction is the orang utan adoption programme, where young orang utans, who were either orphaned or rescued from captivity, are taught how to survive in the wild. As well as orang utans, the centre includes spacious enclosures housing sambar deer, crocodiles, sun bears, civets and bear cats, and three large aviaries featuring hornbills, eagles, kites, storks and a host of other birds native to Sarawak. The World’s first Cat Museum, devoted to all things feline, is in Petra Jaya in the Kuching City North City Hall. 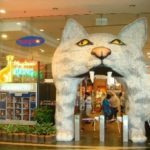 Cat lovers will find a range of exhibits, photos, feline art and cat souvenirs; over 4,000 of them. The museum is housed on the ground on the City Hall building, spread over four galleries covering a total area of 1,035 sq meter.